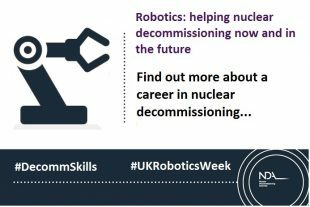 Now is a really good time to be thinking about a career in nuclear decommissioning. We have a challenging, long term mission that will have a really big, positive environmental impact in the UK. 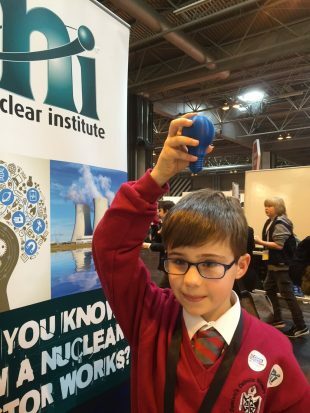 The coming years should see an influx of new people working in the nuclear industry. A Nuclear Workforce Assessment (NWA) has helped us understand the future skills we need to meet our mission as well as skills that are needed to meet the UK energy challenge as outlined in the Nuclear White Paper 2008. Despite reducing the workforce across the NDA estate in the coming decade, we forecast a deficit of skilled people needed to complete our mission over this period. This is because during the next 15 years more than a third of the existing nuclear industry workforce will reach pensionable age. So during the next 5 years, an average of 9,000 people will be needed to replace this aging workforce and meet the increased demand of expanding nuclear power as part of the UK’s future low carbon energy mix. We often find that people come to nuclear decommissioning because of interests and skills which they did not initially consider could be relevant to nuclear decommissioning. Robotics is just one area where you can see the wealth of opportunities over the coming decades. It will need people who can develop, programme, test, install, operate robots on site, as well as repair and maintain machinery. This means we need project managers, designers, engineers, technicians, and programmers. Internationally, the UK is recognised for its skills in decommissioning. We’ve seen UK robotic technology exported for use in other countries, such as Japan. So for those in our supply chain, it’s a career that can take them to other parts of the world that need decommissioning technology. What seems like a fairly typical question to a 20 year old was actually a pivotal moment in Ashley’s career. He owned a PlayStation but it was just a hobby. He didn’t relate it to his work at Sellafield. On a site that is home to over 10,000 workers, Ashley is now one of only 2 fully trained nuclear remote perator vehicle operators in one of the most hazardous nuclear ponds. 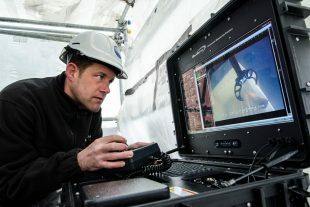 The remotely operated vehicles (ROVs) are a key part of the decommissioning team responsible for emptying storage ponds and silos that date back to the start of the UK’s nuclear industry. Decommissioning these ponds means emptying them of all the radioactive materials and redundant equipment, draining the water and finally demolishing the structures. This is a hugely complicated task and remote technology is helping to safely speed up the process. Ashley found that, unlike gaming, he couldn’t afford to make mistakes. The managers stressed the enormity of the responsibility he would have, the fact that he would be handling some of the most hazardous material on the planet, so he had to work to the highest possible standards expected of a nuclear professional. Ashley trained in a specially designed test tank. This was a completely clean, safe, non-radioactive environment in which he could carry out various challenges and familiarise himself with the kit. He was not deemed competent until the person responsible for signing him off as fully qualified was comfortable to do so. There are so many different ways to enter this industry now. You can join as an apprentice, specialise at university and join as a graduate, receive on-the-job training, or even transfer your skills from other areas, such as the electronics and automotive industry. I’d encourage anyone who wants to have a career that is interesting, challenging and will have a hugely positive environmental impact on the UK, to explore the options to join us in our mission. The RAS Network has successfully developed the concept of "UK Robotics Week" to inspire the next generation of scientists and engineers to push the boundaries further. The week is aimed at everyone, from children to industry to government. Innovate UK's RAS special interest group aims to bring together an integrated community of entrepreneurs, innovators, researchers and potential end users to create a vision for the emerging industrial Robotics and Autonomous Systems (RAS) sector in the UK.